We are getting soft...As for me, give me a fixed gear! What is a Fixed-Gear Bicycle, and Why Would You Want One? he oldest and simplest type of bicycle is the "fixed-gear" bicycle. This is a single-speed bike without a freewheel: that is, whenever the bike is in motion, the pedals will go around. You cannot coast on a fixed-gear machine. any enthusiastic cyclists ride such bicycles by choice, at least part of the time. Why would anybody do that? It is not easy to put into words. There is an almost mystical connection between a fixed-gear cyclist and bicycle: it feels like an extension of your body to a greater extent than does a freewheel-equipped machine. If you are an enthusiastic, vigorous cyclist, you really should give it a try. There are many reasons, including: Fun, Fitness, Form, Feel & 'Ficciency! t takes a bit of practice to become comfortable on a fixed gear. Most cyclists, trying it for the first time, will automatically try to coast once the bike gets up to a certain speed. The bike will not allow this, and it is disconcerting. It takes a couple of weeks of regular riding to unlearn the impulse to coast, and become at ease on a fixed gear. It is worth going through this learning experience, however, because once you do so, you will discover a new joy in cycling. When you ride a fixed gear, you feel a closer communion with your bike and with the road. There is a purity and simplicity to the fixed-gear bicycle that can be quite seductive. Somehow, once you get past the unfamiliarity, it is just more fun than riding a bike with gears and a freewheel! If you won't take my word for it, read some Fixed-Gear Testimonials. iding a fixed gear on the road is excellent exercise. When you need to climb, you don't need to think about when to change gears, because you don't have that option. Instead, you know that you must just stand up and pedal, even though the gear is too high for maximum climbing efficiency. This makes you stronger. If you have the option of gearing down and taking a hill at a slow pace, it is easy to yield to the temptation. When you ride a fixed gear, the need to push hard to get up the hills forces you to ride at a higher intensity than you otherwise might. Really steep hills may make you get off and walk, but the hills you are able to climb, you will climb substantially faster than you would on a geared bicycle. When you descend, you can't coast, but the gear is too low. This forces you to pedal at a faster cadence than you would choose on a multi-speed bicycle. High-cadence pedaling improves the suppleness of your legs. High rpm's force you to learn to pedal in a smooth manner -- if you don't, you will bounce up and down in the saddle. Most cyclists coast far too much. Riding a fixed-gear bike will break this pernicious habit. Coasting breaks up your rhythm and allows your legs to stiffen up. Keeping your legs in motion keeps the muscles supple, and promotes good circulation. fixed gear gives you a very direct feel for traction conditions on slippery surfaces. This makes a fixed gear particularly suitable for riding in rainy or icy conditions. This same feel for traction will help you learn exactly how hard you can apply your front brake without quite lifting the rear off the ground. Most fixed-gear riders only use a front brake--a rear brake is quite unnecessary on a fixed-gear machine. Because you are more solidly connected to the bike, you have better control of it in bumpy conditions or in difficult corners. On any road bike, the rider must learn to un-weight the saddle to ride over bumps. Most cyclists coast to do this. A fixed-gear rider will learn to "post" over bumps without breaking stride. fixed-gear bike is considerably lighter than a multi-speed bike of comparable quality, due to the absence of the rear brake, derailers, shift levers, and extra sprockets. A fixed-gear bike also has a substantially shorter chain. A properly set-up fixed gear has a perfectly straight chainline. This, plus the absence of derailer pulleys, makes a real improvement in the drive-train efficiency, an improvement you can feel. any people think of fixed-gear bikes and track bikes as synonymous, but they aren't. Track bicycles are designed for use on velodromes (bicycle tracks). Some riders do ride them on the road, but they are less than ideal for road use. Track bicycles are set apart from road bicycles by more than the fixed gear. It is possible to fit a brake to some track bikes, but it is often quite difficult, due to the extremely tight frame clearances. Extremely short-reach brakes are needed. Track bike fork blades are usually round instead of oval, as those of a road bike are. This makes them stiffer and more rigid laterally, a good thing for hard out-of-the-saddle sprinting, which can apply considerable side loads. Unfortunately, they are less rigid front-to-back, so if you fit a brake, the fork may flex objectionably when the brake is applied. The frame geometry of a track bike is also different from that of a road bike. Since tracks don't have bumps or potholes, they are built stiffer, with more-upright frame angles. This is good for maneuverability, but causes them to ride harshly on real-world pavement. In addition, track bikes have very tight tire clearance, since there is no reason to use any but the narrowest tires on the track. This can limit your choices for on-road use. Track bikes don't have quick-release wheels, making it harder to fix a flat on the road. Track bikes don't permit the mounting of fenders, limiting their usefulness in sloppy conditions. Some riders do prefer to ride track bikes on the road, especially those who are or were into track racing, and have become used to the feel of a track bike. Track-bike riding has attained cult status in New York City, in particular. espite the coolness factor of true track bikes, a fixed-gear road bicycle is what I would recommend for the road cyclist in search of the benefits of fixed-gear riding. This would typically be an older road bike, modified into a fixed-gear machine. Most older "ten-speeds" are good candidates for this sort of modification. These bikes have the appropriate geometry for comfortable road riding, come with brakes, quick-release wheels, fender clearance, sometimes even water-bottle braze-ons. You could buy a ready-made fixed-gear road bike, but I have a detailed article on Fixed Gear Conversions that will help you build your own. fixed-gear mountain bike may be the ultimate in heavy-duty urban transport, and, if you are adventurous enough, you can even take it to the woods. Mountain bikes tend to have adequate ground clearance, although most, alas, have vertical dropouts. Drivetrains for fixed-gear bicycles are similar to those for other non-derailer bicycles. Equipment choices, installation and adjustment are described in our article on derailerless drivetrains. Specifics which apply to fixed-gear bicycles are described below. ear choice for a fixed gear is a very personal matter, and will depend on your style, your goals, and the terrain you ride in. I live in New England, with small rolling hills. For a bike with normal road-type wheels and 165 mm cranks, I find that 42/15 suits me best. This gives a gain ratio of 5.77 (75.6" / 6.05 m gear). This is low enough that I can make it up the hills where I usually ride, but high enough that I can go reasonably fast down the other side. 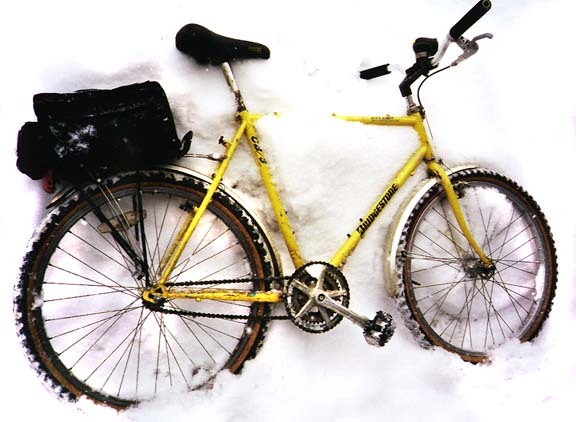 Racers using a fixed gear for winter training usually like a considerably lower gear to improve their spinning technique. Those who live in the flatlands will likely prefer something substantially higher. When I visit my sister in Illinois, I flip my wheel around so that I can use the 42/14, a gain ratio of 6.18 (81.0" / 6.48 m). Generally, the higher the gear, the more fun the ride, as long as your gear is low enough to let you climb the steepest hill you need to climb. Time-trialists often prefer something higher yet. (Many British time-trialists prefer a fixed gear for these road events.) Beryl Burton, probably the greatest time-trialist in history, used a fixed gear almost exclusively. If I recall correctly, she usually ran a 52/14 or 52/13! Just as a low gear lets you apply a higher forward force to the tire for hill climbing, a low gear also allows a greater resistant force at the tire for the same amount of leg effort. The lower your gear, the lower your maximum speed will be, and if you're not going so fast you don't need as powerful a brake. If you plan to do skip stops on a regular basis, you might also consider the number of skid patches your chosen gear ratio will create. A fixed-gear hub may be single-sided, or a "flip-flop" hub with a sprocket on each side. These may be fixed sprockets of different sizes, or one may be fixed, the other freewheeling. It is also possible to modify other hubs to use with a fixed sprocket. Details are in our article about fixed-gear conversions. he most important characteristic to look for in choosing pedals for a fixed-gear bike is good ground clearance. You should also choose pedals that are easy to get in and out of, because both operations are somewhat complicated by the motion of the pedals. Generally, I recommend using whatever pedal/shoe system you are most used to. Getting used to fixed-gear riding is challenge enough without also trying to get used to a new pedal system at the same time! When I used to use toe-clips and straps, I fit two toe straps to each pedal, partly because they help keep my feet in better alignment (since I don't use cleats) and partly for safety. Toe straps can get highly stressed on a fixed-gear bicycle, and if they break, unpleasant consequences may ensue. Because there is no coasting, getting a foot into a toe clip when starting is more difficult than on a freewheeling bicycle, and tightening or loosening a toe strap is devilishly difficult. This doesn't matter to a track racer, who is held up by a coach or other helper -- the "starter" -- at the start of a race. It does matter when using a fixed-gear bicycle on the road. For this reason, clip-in pedals and cleated shoes are preferable. Be comfortable with your chosen shoe and pedal system on a freewheeling bicycle before taking up fixed-gear riding. Sometimes, novice fixed-gear riders will try to use plain pedals with no form of retention system. I strongly advise against this. Riding fixed with plain pedals is an advanced fixed-gear skill, only recommended for experienced fixed-gear riders. We have another article with more about shoe and pedal choices and adjustment. iding a fixed-gear bicycle requires proper mounting technique. Many cyclists have bad mounting habits, such as swinging the leg over on-the-fly, or starting up by shuffling their feet against the pavement. These techniques work even worse on a fixed-gear bicycle than they do on a freewheel machine. Getting your first pedal into the proper forward-and-up position is a bit trickier with a fixed gear, since you can't just spin the pedals backward. The trick is to put your foot on the pedal, then lift the rear end of the bicycle up so that you can turn the pedals. I used to lift the bicycle up by the edge of the saddle, but I damaged a Brooks Pro that way--the rivets that held the leather top to the saddle frame pulled out from being stressed in this unanticipated direction! My friend Osman Isvan taught me a much better technique. The trick is to straddle the bike, put one foot on a pedal, lock up the front brake (another reason to have a front brake) and press forward on the handlebars. The forward force on the bars will lift the rear wheel enough to let you revolve the pedal to where you want it. ou can dismount in the normal manner from a fixed-gear bicycle, but advanced fixed-gear riders might enjoy learning a special, very cool-looking dismount that can only be done from a fixed gear. Instead of getting off to the side of the bicycle, the fixed-gear rider can go straight off the back. This technique works best if you ride with clips and straps, but if you are really proficient in disengaging from clipless pedals, try it at your own risk. As the bicycle slows to near walking speed, disengage your left foot, then wait for the right pedal to get to the bottom of its circle. As the right pedal starts to rise, straighten your right leg and let the motion of the pedal lift you up. Let go of the handlebars, let the saddle move forward between your legs, and put your left foot on the ground. As the bike goes ahead, grab it by the saddle. It takes a bit of courage to try this, but it is actually very easy to do. It is also extremely impressive to watch. When executed properly, it is very smooth, and you can go from riding to walking in a single fluid motion, without ever coming to a stop. ome fixed-gear riders ride on the road without brakes. This is a bad idea. I know, I've tried it. If you do it, and have any sense of self-preservation at all, it will cause you to go much slower than you otherwise could, every time you go through an intersection, or pass a driveway. The need for constant extra vigilance takes a great deal of the fun out of cycling. You really should have a front brake. A front brake, all by itself, will stop a bicycle as fast as it is possible to stop. This is true because when you are applying the front brake to the maximum, there is no weight on the rear wheel, so it has no traction. One of the wonderful things about fixed-gear riding is that the direct feel you get for rear-wheel traction teaches you exactly how hard you can apply the front brake without quite lifting the rear wheel off of the ground. This is a very valuable lesson for any cyclist who likes to go fast; it could save your life. There is really no need for a rear brake on a fixed-gear bicycle. By applying back-pressure on the pedals, you can supply all the braking that the rear wheel really needs. In fact, it is fairly easy to lock up the rear wheel and make it skid, unless you are running a rather high gear. Some fixed-gear fans make a point of not using their brake except in an emergency. I am not sure that this is a good idea. Heavy-duty resisting is widely reputed to be bad for your legs, and to be counterproductive for building up muscles and coordination for forward pedaling. Google for "eccentric contraction" for more on this topic. Eccentric contraction is reputed to cause micro-tears to your muscle tissue, so it actually weakens your muscles, unlike other forms of exercise. This is a lot like car drivers who use their transmission and clutch to slow down, even though the car has a special set of parts made for the exact purpose of slowing down. Brake shoes are cheaper to replace when they wear out than clutches are. rakeless riders generally need to master a technique called the "skip stop." This is a way that you can actually lock up the rear wheel using your legs alone. f you make a habit of doing "skip stops" you will wear your rear tire out considerably faster than if you use your front brake. This problem is exacerbated by certain gear ratios, because you may tend to repeatedly skid on the same section of the tire. Explanation: let's look at 45/15, or 3/1. The rear wheel turns exactly 3 times for each turn of the cranks -- so, if the same foot is forward, the same place on the rear tire is always down. 1/2 turn of the cranks places the other foot forward, and turns the rear wheel 1 1/2 times. Then, the opposite place on the tire is down. Similarly for higher numbers, if the numerator of the reduced fraction is even, skid patches will be in the same places with either crank forward, but if the numerator is odd, the number of skid patches with each crank forward will be odd, and skid patches will interleave. John Allen's Excel spreadsheet calculates the number of skid patches for any sprocket combination. A rear brake also leaves skid patches randomly unless the rear rim is damaged. The front wheel does not skid in normal braking. A front brake also can stop the bicycle much shorter, but requires care in use to avoid pitching the rider forward: see my article on braking and turning. Conventional wisdom: "a bicycle must be moving forward to keep its balance." Not so! The act of balancing motionless on a bicycle is called a "track stand". The rider turns the front wheel to about a 45 degree angle and balances with the cranks horizontal. So the wheel can be brought back to straight ahead even if there is toe clip overlap, the crank on the side toward which the bicycle is steered faces forward. If the bicycle starts to lean to that side, a slight forward movement of the cranks will bring the tires back under the rider's center of gravity. If the bicycle leans the other way, rolling backward will correct the lean. This is the same action as putting more weight on the left leg to avoid falling to the left, and vice versa, but it takes some practice and it is easier with a low gear. The Guinness Book of World Records once had a category for the slowest bicycle ride, but further entries were disallowed after cyclist Dave Steed held a track stand for 9 hours. It has been reported that he later held one for 24 hours and 6 minutes. On the banking of the track, where races are run counterclockwise, the front wheel is usually turned to the right. It is possible to do a track stand on a freewheel-equipped bicycle if the front wheel is pointed up a sloping section of road -- so, on a crowned road in right-side driving countries, the front wheel is turned to the left. The technique must be learned separately each way. A cyclist who has learned both ways can ride a fixed-gear bicycle backwards, switching between a right-side track stand and a left-side track stand. The great Major Taylor once won a match sprint race in this way, by backpedaling a half turn to get behind the other racer for the final sprint to the finish. Following this, the tactic was banned, though track stands are still permitted in match sprints. t is never a good thing to strike your pedal on the ground while cornering tightly. On a freewheel bike, you can coast though the corners with your pedals horizontal, thus avoiding any chance of striking. On a fixed-gear machine, you don't have this option. If you do bang a pedal on a fixed gear, the pedal can lift the rear wheel off the road, and down you will go. This has never happened to me, but it is something to bear in mind. How much of a problem this is will depend on your bottom bracket height, crank length, and the design of your pedals. Most of my fixed-gear bikes have 165 mm cranks,which give a bit more ground clearance than the 170 mm's usually used on road bikes. I also make a point of using pedals that don't stick out too far. hrowing a chain on a freewheel bike is no big deal, but it can be very dangerous on with a fixed gear. If the chain comes off of the chainwheel, it can get hung up or even loop around the rear sprocket, and can cause the wheel to lock up. If this happens while you are leaned over in a turn, you will almost certainly crash. This is prevented by making sure that your chainline is straight, and that your chain is adequately tight. he other danger of fixed-gear bicycles is at its greatest when the bike is in a repair stand. If you hand-pedal it and then accidentally have a finger an article of clothing come into contact with the chain or a sprocket, the momentum of the wheel will keep the drive train rolling. You can lose a finger that way. Sorry to gross you out with these photos, but this is a real danger! Likewise, when riding, if you are wearing floppy pants, or have an un-tied shoelace, you may get your clothing caught in the drivetrain. On a freewheel bike, this it is a minor inconvenience. You have to coast, then pedal backward to release your clothing. The worst that will happen is that your clothing will get soiled. With a fixed gear, you have no such option. If you catch a shoelace, it will get torn off or your shoe. If you catch a trouser leg, you can really get hurt.